So, here we are. The end of November and it is mission accomplished. I have not shaved all month and have a relatively scruffy, almost Grizzly Adams style beard. As it stands, the charity balance is sitting at £205. This has taken me a bit by surprise, I was expecting about £20 with half of that coming from me. Honestly though, I came up with this idea as a comedic alternative to Movember and really didn't think it would take. This is the first proper charity thing I have ever done. I'm always quick off the mark to give to other people but it was nice for a wee change to try and get the money from others. What to do now though? The intention was to do this, and go for the full clean shave to get rid of it but I'm not sure now. Firstly, as a fat man, the beard hides the double [or in my case triple] chin. Having one less area of fat to try and disguise is always a bonus. Secondly, it is quite warm for this weather. I'll probably keep the basis that is there but tidy it up a bit. To all those who contributed, thanks very much. It was a pleasure to save lives through laziness for you. If you have not contributed but would like to, you can still use the button below. If you don't do the whole internet thing, you can email me using the link at the bottom of this page, text me or send a carrier pigeon and I will add your name to the form and get money off you at a later date. All proceeds go to Everyman - The Male Cancer Campaign and you can view the beard's progress over the month using the embedded web album link below. "You look like a young Brian Blessed!" 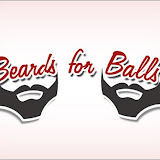 Remember, you can donate using the above button with all proceeds going to Everyman - The Male Cancer Campaign and follow daily beard progress using the embedded web album link below. So, 8 days in and the campaign is still going strong. The face ain't been touched and I have to admit, although there is no itching yet, it is starting to look a bit scraggly. This could be amusing by day 30. Remember, you can follow daily beard progress using the embedded web album link at the bottom of the page. It is no secret that I am a bit crazy when it comes to online blog challenges, take the year of food for example. So, imagine my curiosity when I heard about the Movember campaign. The concept of the annual November moustache-a-thon did pique my interest but I was not too keen on the single strand of hair. 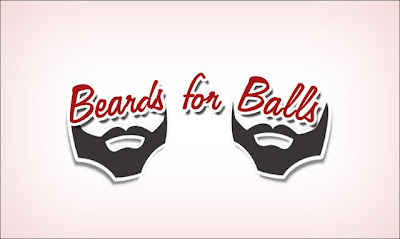 Instead, I have created my own charity concept - Beards for Balls. For the month of November, I am not going to shave, trim or cut my facial hair. In my mind I am going to end up looking like Joaquin Pheonix from "I'm Still Here". My normal daily look is a bit of stubble that I run the beard trimmer over twice a week just to keep it under control but that is getting locked away till next month. I was gonna use fully clean shaven as the starting point, but decided where is the fun in that. To get maximum Grizzly Adams, I'll start from my daily style. Everyman - The Male Cancer Campaign, to help testicular and prostate cancer. If you like the idea and would like to make a donation towards this charity, you can use the permanent widget to the right or the button in this post. It may not seem like much of a challenge but believe me, any more than a week and a half of not shaving is usually itchy enough so this will be a porper test of perseverance. To fit in with my blog obsession I am going to take a photo of my face everday and upload it to a Picasa Web Album and see what kind of animated gif we can get at the end of it. Once again, thanks to Mario @ Lucid Studio for the graphic.